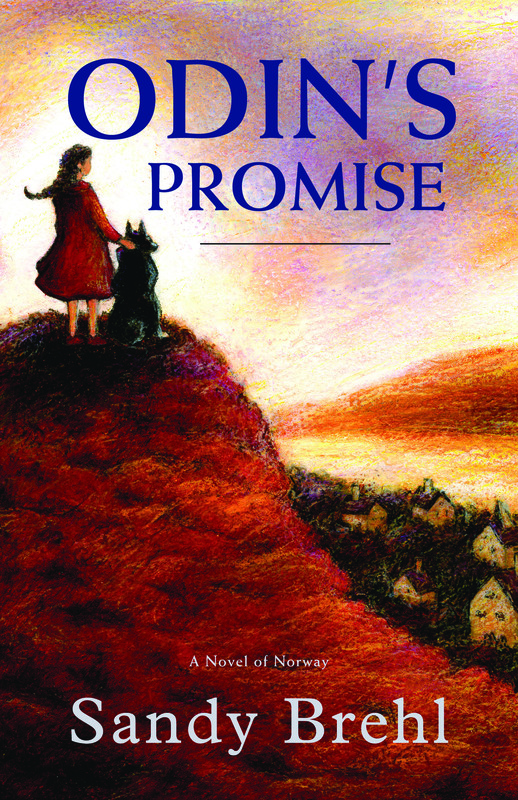 I recently interviewed Sandy Brehl, the author of Odin’s Promise, A Novel of Norway. (Published by Crispin Books, an imprint of Crickhollow Books, Milwaukee WI 2014) We spoke via Skype. SGL: You say that Odin’s Promise started as a picture book, morphed into an adult story and finally ended up a middle grade historical. Tell me a little about that Journey. SB: I tell people my book took 35 years and one year to get published. The inspiration for what I thought would be a picture book came when I first visited Norway 35 years ago. I went with a friend who had many relatives there. They told us stories about what it was like during the German occupation. All evidence of old Norway were removed and replaced with a ‘New Norway’ flag representing a partnership with the Nazis. I saw these stories as richly illustrating a picture book. I knew enough about picture books, but didn’t know that I really needed to have little kids in it! SGL: When did you realize it wasn’t a picture book? SB: I sent it to a book doctor who told me it wasn’t a picture book, but if re-worked, it could work as a book sold in museum gift shops. SB: I re-worked the picture book as an adult book. I had it vetted on cultural authenticity and had good feedback. I was in a critique group that was working on adult writing and they loved it. SGL: During revisions, you said you read a dissertation that opened your eyes to the resistance in Norway. SB: The dissertation, by Kathleen Stokker, PhD, was “How Folklore Fought the Nazis.” Young people in Norway were finding ways to resist the Nazis by using their humor and culture. For example, celebrating the festival of Syttende Mai was forbidden. One of the stories I heard while in Norway was that one couple purposely planned their wedding for that day, like the couple in the book. Another way they resisted was by hiding radios to listen to the BBC to find out progress of the allied forces or the fate of exiled King Haakon VII. Radios were forbidden by the occupying army. SGL: Mari, your main character, finds her voice and helps the underground in her own way. Were you shy as a child? Is Mari based on you? SB: She wasn’t based on me in any way while I was writing. She struggles to find a sense of power or control her world. I, growing up, thought I could control the world. If I have a role, I run with it and do it confidently, like being a teacher. But if I don’t have a designated role, I just as soon not be there. I’m really uncomfortable in strictly social settings. Something I discovered after I wrote Odin’s Promise is that Mari is very much like stories my mother told me about herself. She grew up in a very rural area of Kentucky. She was great in school. Her siblings were all much older than she, so she grew up shy and with a dog as her best friend. SGL: How long have you been writing? Did you dream of being a writer when you were a child? SB: No. In general, I did well in school. I thrived—it was a role I could take on to define myself. I always wrote competently. Writing assignments were functional, not really creative. My mother was always a writer. She had things published and kept multiple journals. I did not keep a journal. I didn’t consider writing a viable career. When I hear kids say they love to write I tell them not to give up on writing as a career. SGL: You mentioned in a blog post that there are a handful of characters from books you read when you were young that stayed with you. Can you name a couple and why they had an impact on you? SB: At an early age I read a book called Dibs in Search of Self. It was written for adults and it was about a child who is seeing a therapist. When the child hears the words “rain forest,” he pictures the roots of a forest raining down and destroying everything, a very terrifying image. Another book that impressed me was Clay Fingers, a book about a therapist who used clay in therapy. Both of these books convinced me that I wanted to work with kids who needed extra support. SGL: Is Odin’s Promise your first attempt at publishing? Have you had many rejections? (Sandy laughs) SB: I wrote a Christmas story as a result of a fender bender. I didn’t have a lot of money to pay to have my car fixed up so I thought maybe I can write a Christmas story and get paid for it. It was already October. I was thinking it could be published in time for Christmas! That was rejected but I ended up giving it as a gift that year because I had no money for gifts. After that I began reading Children’s Writer and Illustrators Markets and other resources. I have file drawers full of rejection letters. I used those with kids all the time. I used them in my classroom when I was teaching to show them what editors said about my writing. When teaching kids writing, looking at early drafts is important. SGL: What’s next for you? What are you working on now? SB: I have a lot of Norway research far beyond the first year of occupation, so I am considering a sequel. It was not my original intent, but readers have expressed interest. I have two picture book manuscripts that I am sending out, two more that I’m re-working with my critique group, and many others in various states of development. I’m also working on a graphic style book and a middle-grade contemporary with a male character. SGL: Do you have any appearances coming up? SB: Marketing this release is my current project. The schedule of events is just now starting to fill in and I welcome inquiries about appearances. A study guide was piloted before the book released, which is now offered on my website. I’ll meet with a middle grade ‘lunch bunch’ at New Berlin Public Library in August, speak to a Rotary Club in July, have a signing at Whitnall School District on September 13 from 2:00-3:00. In March 2015, the Wisconsin Norwegian Elkhound group will host a national gathering in Wisconsin. They are giving signed copies of my book as prizes to winners, and I’ll have a presentation and signing session there. My website is being revised this summer and a full calendar will be posted there. The contact tab can be used now to inquire about visits and signings. After reading Odin’s Promise I’m convinced she won’t have to wait that long. Her readers will be anxious for more. Sandy can be reached here Check her out on Twitter at: @SandyBrehl and @PBWorkshop She is also on Facebook.